Indonesian authorities investigating corruption during the creation of an anti-graft monument and park project have named 18 civil servants and businessmen they suspect of misappropriation of public funds. 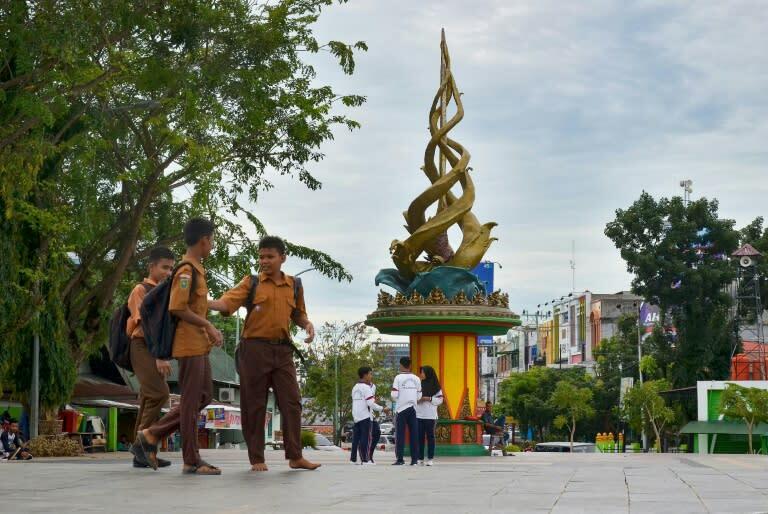 The park and sculpture -- depicting golden dragon tails twisting around a traditional dagger -- on the island of Sumatra were inaugurated late 2016 on International Anti-Corruption Day and aimed to symbolise the province's fight against graft. But Riau province prosecutors now say that the tender process was rigged by 13 public servants and five businessmen, alleging on Wednesday that the group had conspired in a plot that caused Rp 1.2 billion ($89,000) in losses. "We suspect the project involved them working together. They made up things to win the tender and give it to the contractor," said Sugeng Riyanta, a special crime assistant for then prosecutors office. "Public servants deliberately falsified certain documents... so only one party could win." The suspects, who have not been detained, face a number of charges, including corruption, falsifying documents, and breaking a law that prohibits public servants to be involved in tender projects. The brazen nature of the case has underlined the uphill struggle facing authorities trying to tackle corruption in the graft-plagued nation. Indonesia was ranked 90th out of 176 countries and territories in Transparency International's Corruption Perceptions Index in 2016. A number one ranking represents the least corrupt.